(Phys.org)—People generally like the idea of facial recognition technology, if they are asked about it in the context of identifying dangerous killers on the loose and people out to spread mayhem. People generally hate the idea of facial recognition technology in the context of their own faces showing up without their permission on social networking sites or on databases designed to boost a company's sales. As law-enforcement and commercial companies explore facial recognition technologies, privacy groups are throwing up red flags. They are alerting the public that facial surveillance may not only become very advanced but very ubiquitous. From Japan, scientists are offering an anti-surveillance visor, designed as a tool to thwart facial recognition technology. 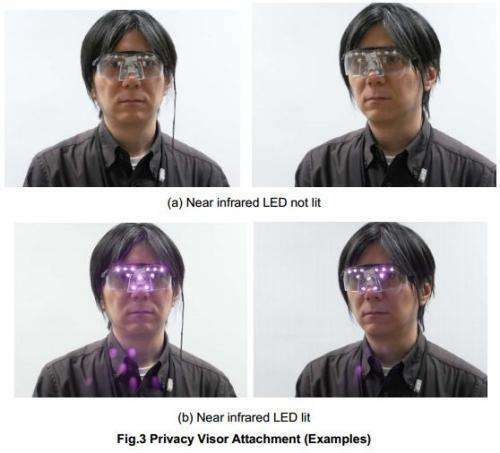 Isao Echizen, associate professor at Tokyo's National Institute of Informatics, jointly with Prof. Seiichi Gohshi of Kogakuin University, are working on infrared LED glasses for evading facial recognition. According to the official release from the National Institute of Informatics, this is "technology for protecting photographed subjects from the invasion of privacy caused by photographs taken in secret and unintentional capture in camera images." The release said their new development "can disable facial recognition of photographed subjects only when photos are taken. It achieves this by the photographed person wearing a privacy visor that incorporates a near-infrared light source that affects only the camera and not people's vision." The two worked on the glasses to protect individuals who do not want their images uploaded online without permission or their image to be searchable via facial recognition software on online sites. The glasses, in prototype, make use of the concept of near-infrared light to block face recognition cameras. The glasses create glare using 11 infrared LED lights, which are not visible to the human eye but are to digital cameras. The near-infrared LEDs were implemented on the basis of arrangement of the "noise" light source. Echizen began experimenting using light sources to create "noise" across key areas of the face used in the recognition process, to render the recognition software useless. He especially targeted the areas around the eyes and nose, which are the significant facial areas used for identification. The glasses in their present state are goggle-shaped with small circular lights. They are connected to a wire and a battery that the user carries in the pocket. Brian Ashcraft, a journalist based in Japan, noted that the goggles were shown on TV Tokyo last year. Echizen has received expressions of interest from companies toward commercializing the visors. Echizen said further developments in this privacy visor will involve an improved version without a power supply consisting of transparent materials reflecting or absorbing specific wavelengths. He predicted that the device could be reasonably priced. How about just turning off the camera? This is more to thwart facial recognition that is used wherever you are in public places (there are always plenty of CCTVs there). I could go for a pair myself. Might be fun to wear at the next public protest (since masks are forbidden). With this knowledge in hand, I see no reason I can't build my own. I envision a series of infrared leds attached to a hat or scarf or on lapels of shirts, jackets, etc. Bright enough and they would achieve the same effect. Keep the batteries charged up with tiny solar cells, like the ones in pocket calculators, and you won't have to worry about the batteries going dead at an inopportune time. I throw the facial recognition system off simply by wearing a Bin Laden mask. Of course it will trigger their alarms, but then they soon realize there's no need to bother. Facial recognition is only one small aspect of the biometric monitoing available to Authorities. Your body dimensions and walking style and gait are all able to be used. Beyond that, if you simply hang around with the same people, in roughly the same places, then the 'system' (whatever that might be), can predict your movements, and marry up expectation against actuals. In the end, I can't encourage enough, the work we can do to make it more difficult for the nefarious use of your identifying information. Lens filters. Good grief, they've been around for film cameras for just about forever. From the comments, it looks like nevertheless lots of people would be willing to pay for the illusion. Seems to me obvious that any surveilance outfit this system is trying to thwart would simply program their recognition software to immediately identify any person wearing a system like this for immediate intense further scrutiny. Sort of a reverse hiding effect, more like "Hey you guys, over here! Check me out!!"